There were several types of ashtray produced. 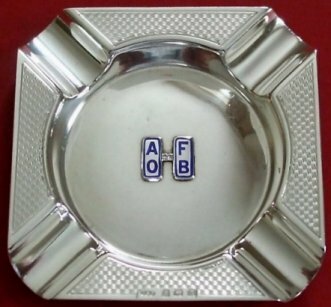 The Birmingham Medal Co. produced at least 5 different ashtrays in either silver or E.P.N.S. (Electro Plated Nickel Silver), and an unbreakable fibre ashtray with a miniature jolly brewer in the centre. Large E.P.N.S. ashtrays comprising of a car/motorcycle mascot in the centre of either a 4 inch ( at 20/- ) or 5 1/2 inch ( at 30/- ) E.P.N.S. ashtray were produced. 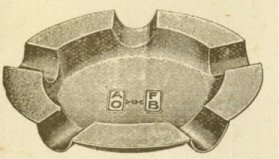 Large 5 "rest" ashtrays were priced at 18/- 6d silver, 5/- 6d for E.P.N.S, the smaller 4 "rest" ashtrays were 10/- 6d silver and 5/- 6d E.P.N.S. both having soldered A.O.F.B. links inside. 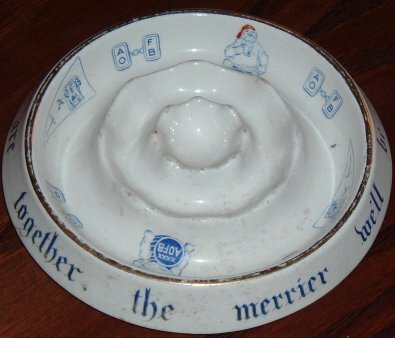 Minton produced a porcelain ashtray as seen below. Picture courtesy of Paul Turner.